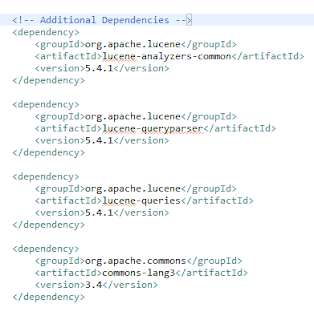 Let us get ahead with Apache Lucene 5.3.x/5.4.y; The most important aspects of Lucene is mentioned under each of the headings. 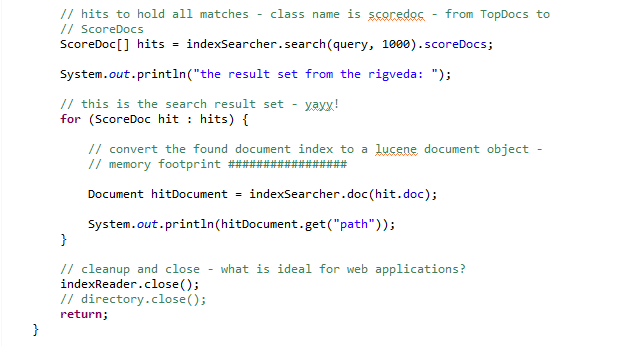 Inverted Index is used to get traverse from the string or search term to the document id's or locations of these terms. If we were to visualize this in terms of an 'index' - it would be 'inverted', as we would be using the term as a handle to retrieve 'id' or 'locations' - reverse of the popular usage of an index. 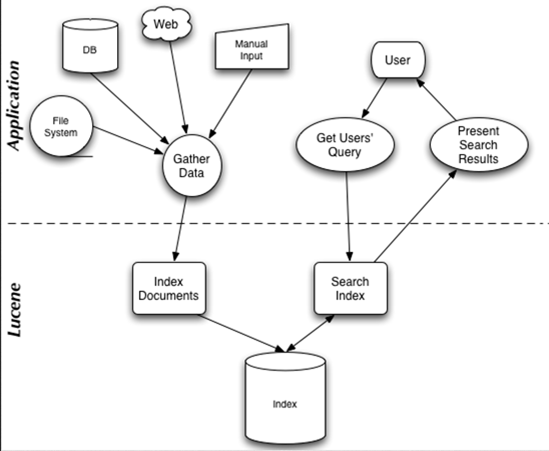 Index is an handle (information) that can be used to get further related information from a file, database or any other source of data. Usually, Index is also accompanied by compression, check-sum, hash or location of the remaining data. Index contains multiple Documents. Document is a collection of Fields and the Values against each of the Fields. It is more like saying "Employee Name" - "Sumith Puri" | "Employee Desingation" - "Software Architect" | "Employee Age" - "33" | "Employee ID" - "067X" forms a document. The Lucene Indexing Process adds multiple documents to an Index. The entire set of Documents is called the Corpus. Field contains Terms and are simply 'Sets of Tokens' of information. 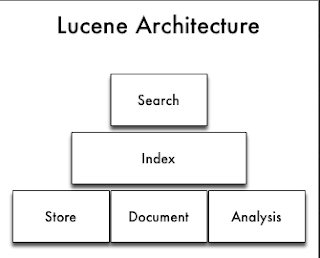 The Lucene Indexing process take care to Identify (or Process) Fields and Index them. Fields belong to a Document always. Terms are nothing but a 'Token' or 'String' of Information. This 'Term' is the smallest piece of Information that will be Indexed to form the Inverted Index. Set of Distince Terms is called the Vocabulary. String is simply a 'Token' or the English Language String. Segment is a fragmented or chunked part of the entire Index, for better storage and faster retrieval. Field Names: This contains the set of field names used in the index. Stored Field Values: This contains, for each document, a list of attribute-value pairs, where the attributes are field names. These are used to store auxiliary information about the document, such as its title, url, or an identifier to access a database. The set of stored fields are what is returned for each hit when searching. This is keyed by document number. Term Dictionary: A dictionary containing all of the terms used in all of the indexed fields of all of the documents. The dictionary also contains the number of documents which contain the term, and pointers to the term's frequency and proximity data. Term Proximity Data: For each term in the dictionary, the positions that the term occurs in each document. Note that this will not exist if all fields in all documents omit position data. Normalization Factors: For each field in each document, a value is stored that is multiplied into the score for hits on that field. Deleted Documents: An optional file indicating which documents are deleted. Stemming – Replacing words with their stems. For instance with English stemming "bikes" is replaced with "bike"; now query "bike" can find both documents containing "bike" and those containing "bikes". Stop Words Filtering – Common words like "the", "and" and "a" rarely add any value to a search. Removing them shrinks the index size and increases performance. It may also reduce some "noise" and actually improve search quality. Text Normalization – Stripping accents and other character markings can make for better searching. Synonym Expansion – Adding in synonyms at the same token position as the current word can mean better matching when users search with words in the synonym set. I will shortly be uploading the best way to re-index without causing any downtime to applications. This is for Applications with SLA of 99.99% or Close. 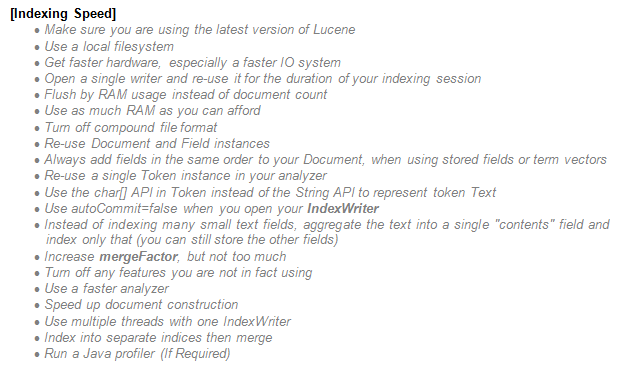 The best practices when using Apache Lucene for indexing and searching, also include the following. 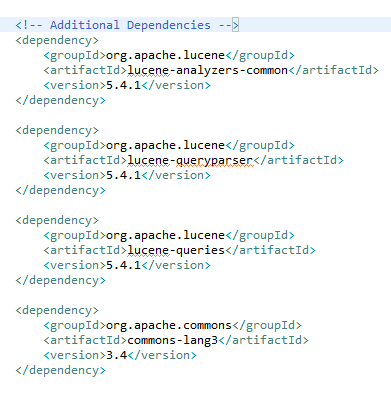 These are directly from the Apache Lucene Wiki, with some modification/addition. You can download the entire sample project (eclipse) with its source code from here This simple-file-search is also called 'brahmashira' [the 4x exponentially stronger weapon than brahmastra from brahma]. Include it directly in your projects and start indexing, searching.